← How do you get World Peace? I have been encouraged to create posts related to the encounters with the wild animals that I share the land and more often than not, my home with. To be honest, I could probably produce a post a day featuring the most amazing creatures that I am constantly surrounded with. Despite the hardship of living as I do in the often harsh conditions of the South Burnett, I feel quite blessed to be living this close to nature. If it was not for the wild residents that surround me, I am not sure that living here would be worth it. Luckily through, there are numerous encounters that make it all worth while for nature lover such as myself. I have seen this beauty before in the evening and had to use a zoom lens to get a pic of her. This time she was very close and even though she is a nocturnal creature, she was on the dome wall within a hand reach. She is probably one of the largest spiders I have seen in Australia. I estimate her size to be at least 10 cm across. Huntsmen spiders do not build webs, but definitely use them for mobility. I had one abseil down from a ceiling down to the floor, it was very amusing. This little lady, and I assume she is a lady as male spiders of most families get devoured during mating, hunts the myriad of insects in the dome. So we have a mutually beneficial relationship and knowing the importance of these creatures, I am more than happy to share my home with her. Plus I find her to be extremely attractive and photogenic, don’t you? Well, just look at those 8 sparkling eyes staring right into the lens, they make my heart melt…. 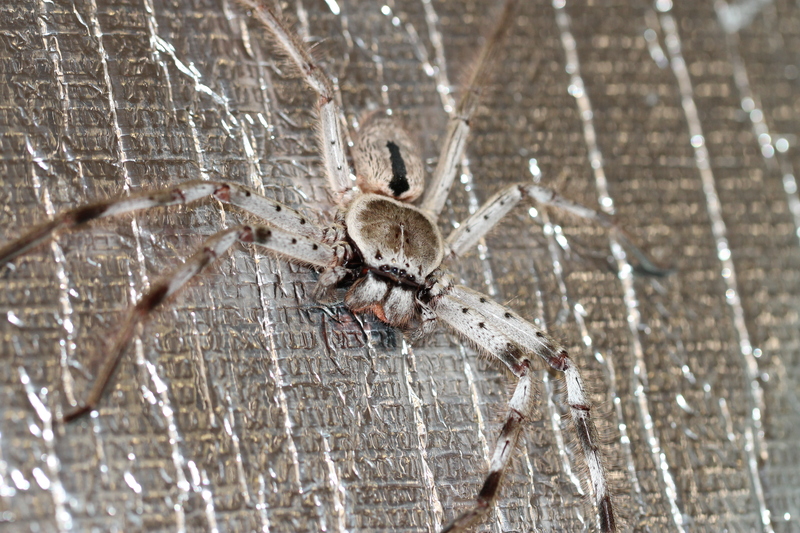 This entry was posted in Living in the Bush and tagged Bush Home Living, Holconia insignis, huntsmen, nocturnal, Sparassidae, spiders. Bookmark the permalink. Great photo Sandra … mandibles in perfect focus.